MSF was founded in Paris, France in 1971. Its principles are described in the organization’s founding charter. It is a non-profit, self-governed organization. Today, MSF is a worldwide movement of 24 associations, bound together as MSF International, based in Switzerland.Thousands of health professionals, logistical and administrative staff – most of whom are hired locally – work on programs in some 70 countries worldwide. 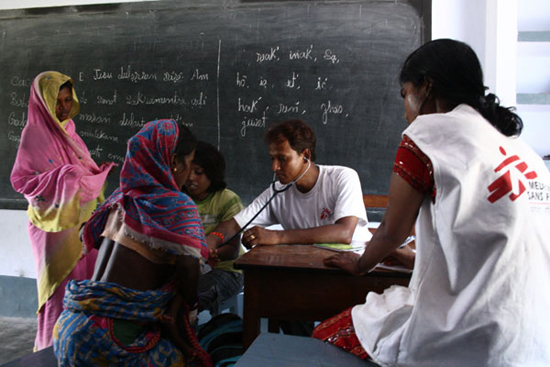 MSF's work is based on humanitarian principles. They are committed to bringing quality medical care to people caught in crisis, regardless of race, religion or political affiliation. MSF operates independently. They conduct their own evaluations on the ground to determine people’s needs. More than 90 per cent of our overall funding comes from millions of private sources, not governments.MSF is neutral. They do not take sides in armed conflicts, they provide care on the basis of need, and they push for independent access to victims of conflict as required under international humanitarian law. MSF medical teams often witness violence and neglect in the course of their work, largely in regions that receive scant international attention. At times, MSF may speak out publicly in an effort to bring a forgotten crisis to public attention, to alert the public to abuses occurring beyond the headlines, to criticize the inadequacies of the aid system, or to challenge the diversion of humanitarian aid for political interests. MSF rejects the idea that poor people deserve third-rate medical care and strives to provide high-quality care to patients. In 1999, when MSF was awarded the Nobel Peace Prize, the organization announced the money would go towards raising awareness of and fighting against neglected diseases. Through the Access Campaign, and in partnership with the Drugs for Neglected Diseases initiative, this work has helped lower the price of HIV/AIDS treatment and stimulated research and development for medicines to treat malaria and neglected diseases like sleeping sickness and kala azar.